Bette Midler : Big band vocal charts from Bette Midler. 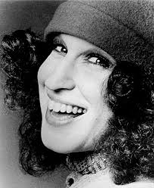 A selection of Bette Midler vocal arrangements for solo vocalist with big band. Born in Honolulu, Hawaii, she is an American singer, songwriter, actress, comedian and film producer. She came to prominence in 1970 whilst singing at the Continental Baths in New York. Her pianist was a certain Barry Manilow, and it was he that produced her first album, "The Divine Miss M". She has produced a number of studio albums including the "Rosemary Clooney Songbook" and the "Peggy Lee Songbook". She has made many films including "The Rose", "Down and Out in Beverly Hills" and"For the Boys". She has received several Golden Globes and Grammy Awards for her acting and singing talents. Which charts is she really well known for? Here are a few that are instantly recognisable. "Miss Otis Regrets", "Stuff Like That There", "On a Slow Boat to China" - a duet with Barry Manilow, "Hey There" and "Mambo Italiano" from the Rosemary Clooney Songbook.